Hard to believe, but Oprah Winfrey has been steadily reinventing television for nearly three decades. First, as the creator and host of the groundbreaking Oprah Winfrey Show, which swiftly transcended its daytime talk show origins to become a critical part of the modern media tapestry, then as founder, chairwoman, CEO and COO of fledgling cable outlet OWN (aka the Oprah Winfrey Network). Now, she’s the executive producer of Selma director Ava DuVernay’s new critically acclaimed OWN original series, Queen Sugar. 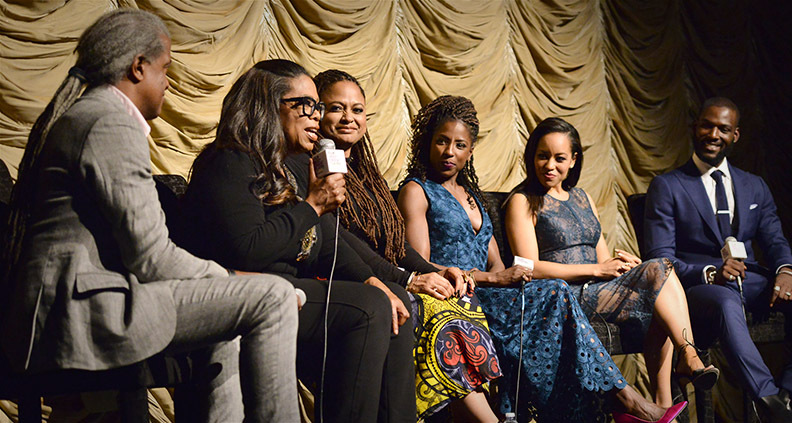 Only a few weeks removed from its early-September premiere, Sugar has already garnered a large and enthusiastic fan base, many members of whom filled LACMA’s Bing Theater for Film Independent’s An Evening with Queen Sugar event Monday, September 26. 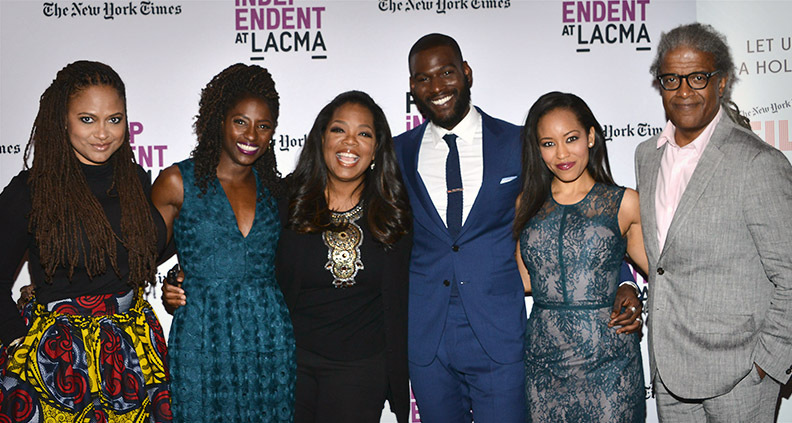 The night featured a screening of “By Any Chance”, the fifth episode of Queen Sugar’s currently airing first season, followed by a spirited Q&A featuring Winfrey, DuVernay and cast members Dawn-Lyen Gardner, Rutina Wesley and Kofi Siriboe, moderated by Film Independent at LACMA curator Elvis Mitchell. Based on Natalie Baszile’s bestselling 2014 novel of the same name, Queen Sugar follows the unfolding saga of semi-estranged siblings Nova (Wesley), Charley (Gardner) and Ralph Angel Bordelon (Siriboe) in the wake of their father’s death, which leaves Charley in charge of an 800-acre sugarcane farm in central Louisiana. The result is a keenly observed family drama unafraid to tackle themes of reinvention, responsibility, business intrigue, violence, race and romance. With so much compelling material filtered through DuVernay’s effortlessly watchable directorial POV, it’s no wonder Sugar has so quickly found an audience—particularly amid a TV landscape largely devoid of complicated, multi-perspective portrayals of the African-American experience. In particular, Winfrey cited a moment in the show’s first episode involving Ralph Angel’s body language as the specific point at which her enthusiasm for the show’s potential solidified. Mitchell observed, “This is what Ava does so well—allowing black people to speak with their bodies.” DuVernay explained that her ability to convey character intention physically rather than verbally is the result of close collaboration with her actors. Mitchell asked Winfrey about the idea of homecoming—a reoccurring theme throughout Winfrey’s acting work from The Color Purple to The Butler. “What does home mean in Queen Sugar?” Mitchell asked. Queen Sugar’s first season is currently airing on Wednesday nights on OWN. For more upcoming Film Independent at LACMA events, click here. To learn more about Film Independent, subscribe to our YouTube channel. You can catch up with the rest of our blog here. And to learn how to become a Member of Film Independent (who knows, maybe you’ll be in our next video!) just click here.